As you likely know, Keith Matune is running in the GOP Primary against Ron Sandack for State Representative of the 81st District. We've covered the 'curious case of Keith Matune' over the past few weeks. You can read some of the coverage here, here, and here. As you also know from reading the Truth Team, we loathe unnecessary GOP Primaries. We're here to help build the party and provide a voice for the elected officials, candidates, and issues that stand not for one-single issue/position, but rather for those Republicans who represent the true "Big Tent". They're what is going to drive our party forward and make our party relevant in the next decade. 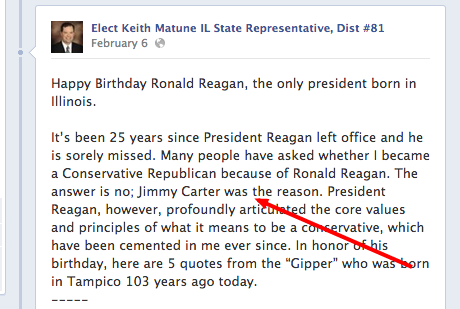 You folks need to check out Keith Matune's latest Facebook post. The first sentence is classic.. It states: "It’s been 25 years since President Reagan left office and he is sorely missed. Many people have asked whether I became a Conservative Republican because of Ronald Reagan. 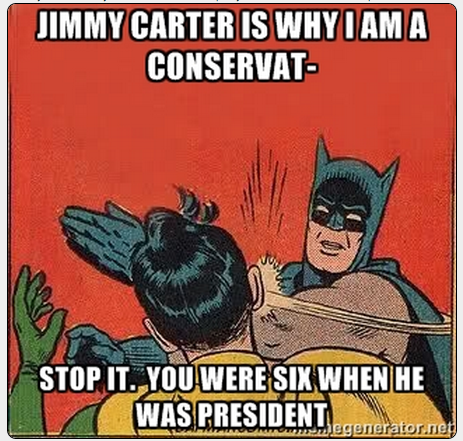 The answer is no; Jimmy Carter was the reason." Matune was 21 in 1991 when he was arrested. Basic math gives him a 1969-1970 birth year. Jimmy Carter was President from 1976 to 1980. Not sure how many 6-10 year olds are that astute on policy? A 10 year old would be in the 4th grade at the oldest. Know what we here at the Truth Team were doing when we were six? We were playing our He-Mans and Legos. We certainly weren't being influenced by national politics. But Keith Matune? He must have been "old for his age", we guess?